Thank You and Keep Donating! Christmas has arrived at Rainford and preparations for our festive Christmas fayre have begun. Thank you to year 7 who have brought in over 300 donations in one day to go to St Helens foodbank. Your generosity will help to support those in need in our local community. 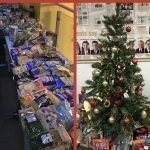 Year 8 & 9 toy contributions are also surrounding Mr Young’s Christmas tree, there will be donated to Ormskirk Hospital Toy Appeal and the Wish FM toy appeal. Please keep the donations coming Rainford, its all for a good cause.